Place a heavy based saucepan over a medium to high heat, add the cumin and coriander seeds and dry toast for 2 minutes or until fragrant. Remove from heat and crush using a pestle and mortar or pulse in a blender. In a large bowl add the water, garlic, crushed spices, rosemary, pepper and egg and mix well. Roll and shape into burgers and chill for 15-20 minutes or longer if time permits. 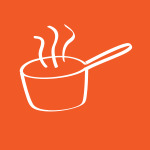 Heat the olive oil in a non-stick saucepan on a medium heat. Cook the burgers until brown (approximately 8 to 10 minutes), turning them every so often.